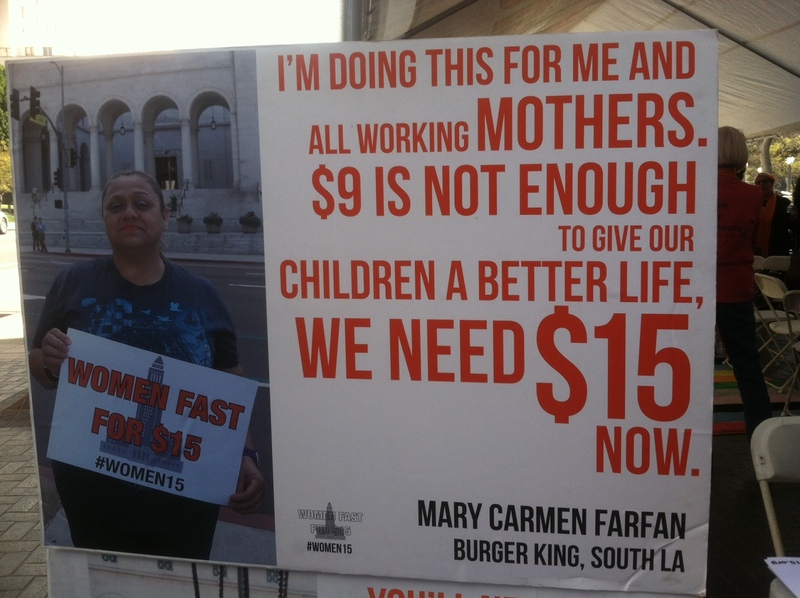 Women are starving on the steps of Los Angeles City Hall. How is it possible that news of eight women on a hunger strike for a livable minimum wage escaped my notice? If you also haven’t heard, I’ll fill you in. 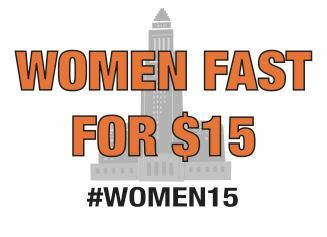 On April 16, several women began a fifteen day fast to demand immediate action to increase the minimum wage to $15 per hour. Put another way: if you care about alleviating hunger and homelessness, about ensuring that children have quality day care and are ready to learn when they go to school, implement a livable minimum wage. The rest gets solved. Some argue that a $15 minimum wage is a job killer. But competing studies support each side’s position. The only thing we do know with 100% certainty is that our current situation is failing. People are hungry. Family homelessness is rising. Multiple families live together in garages. Even full-time wage earners qualify for and receive government assistance. That last fact should galvanize everyone, from liberal to liberatarian. Reliance on government support depresses not only the economy, it dampens the spirit. In the California Department of Social Services offices recently, I witnessed men and women and children wait for hours to meet with case workers in order to continue receiving adequate funds for food and rent. It amounts to mountains of wasted time, frustration, and indignity, instead of hours working for dignified wages. Yes, there are details to be worked out Should tips be included? Should small businesses be excluded? Our leaders have decisions to make. But one thing should be settled: the urgency and need for immediate action for low-wage workers is real. City leaders should act as though it is the size of their paychecks at stake. That it is their family’s pantry that is empty. L.A. may be behind the curve compared with our sister cities of Seattle, SeaTac, San Francisco, Oakland, who have adopted a higher minimum wage, but I, for one, believe L.A.’s leaders have the courage, compassion, and vision to accept the challenge. Thoughtful, respectful comments and dialogue are appreciated.